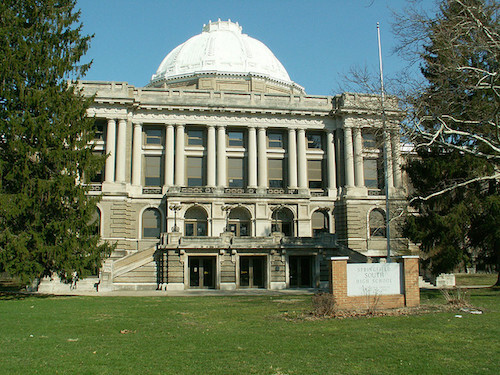 For nearly a century, a beautiful domed building on the south side of Springfield, Ohio, housed a high school. But after a tobacco settlement left the state with additional education funding in 2008, the Springfield City School District (SCSD) made some needed infrastructure improvements. The two high schools were consolidated on the north side of town, and the old building was left vacant. Kim Fish of SCSD used to look at the regal structure, modeled after the Library of Congress and topped by a stained glass dome, and think: “People used to revere education.” Fish was among many educators who dreamed of repurposing the school in a way that retained its educational mission. They found a solution through YOUmedia, a growing network of digital spaces for teens at libraries and museums across the country. 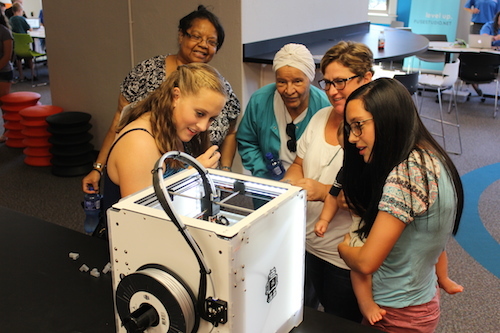 Springfielders check out the 3D printer at YOUmedia. About 90 percent of students in SCSD qualify for free or reduced-price lunches, and only about half go on to post-secondary education, usually community college. The shuttered school was in a neighborhood that lacked enrichment options for young residents. When the state of Ohio announced grants for educational innovation, Fish and her colleagues jumped at the opportunity. Along with opening a new school focused on STEM (science, technology, engineering, and math), they knew they wanted to create an engaging afterschool program. Enter Grammy-winning musician John Legend. A Springfield native and education advocate, Legend pointed the district to YOUmedia, a national initiative to create digital community spaces for teens that started at the Harold Washington Library in Chicago in 2009. YOUmedia provides safe spaces for teenagers to hang out and experiment with digital tools, create media and art, and perform. Adult mentors are there for guidance and support, but youngsters are encouraged to take charge of their own learning and collaborate. When Fish learned about YOUmedia, she thought, “Kids in this community so need this.” In June, SCSD won an $11 million state grant for the space, bolstered by $2 million in state capital and donations. Fast-forward several months, and the building, now known as The Dome, is home to the new STEM school as well as the CareerConnectED Center, which houses YOUmedia Springfield. There are also a makerspace for younger kids and a professional development space for teachers. Fish and her colleagues relied heavily on a network of YOUmedia professionals around the country for guidance in designing the branch, and sought advice from teenagers. It made sense that young people would help craft the program; a central goal of YOUmedia is to cater to youths who do not feel valued or engaged in traditional school settings. After serving as a high school for nearly 100 years, “The Dome” has been repurposed as a digital space for teens. While most YOUmedia branches are at libraries, Springfield’s is operated by the school district. YOUmedia acts as a laboratory for district teachers to experiment with hands-on learning models. Once kids gain a sense of direction and confidence at YOUmedia, they can bring what they learn back to the classroom. When Brown’s teacher recommended she check out YOUmedia, she was immediately game. Now there was a place where she could “go learn something that’s not just narrowed down to reading and writing and math and social studies, but actually your own creative mind,” Brown said. Dosjiné spends her time at The Dome shooting and editing video, and socializing. Another participant, 15-year-old Mustafa Haleem, goes to YOUmedia to code and build electronics—or “stress-paint” to unwind from the school day. Others use the 3D printers on-site or record music. Surprising the staff, many teens gravitate to the sewing supplies. Among other surprises was the sheer number of kids who began showing up at The Dome—sometimes 100 in a night. They are kids from wildly different schools and backgrounds who make unexpected friendships in the casual YOUmedia setting, Fish said.